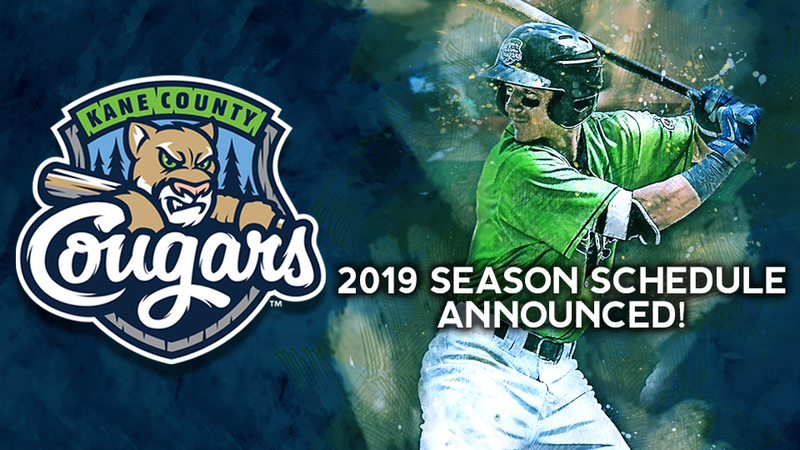 GENEVA, Ill. - The Kane County Cougars organization has announced the game schedule for the 2019 season. Opening Night, which will mark the 29th season of Cougars baseball, will take place on Thursday, April 4 at 6:30 PM against the Clinton LumberKings. The Cougars will face the LumberKings in a brief two-game homestand before traveling to Clinton for the second half of a home-and-home series. The first 1,500 fans attending the games on September 1 and September 3 during this upcoming Labor Day weekend homestand will receive a 2019 magnetic schedule, courtesy of Wintrust Bank. To view and download the entire 2019 schedule, visit www.kccougars.com. In 2019, Kane County will play host to a handful of Eastern Division opponents including the Great Lakes Loons (May 6-8), Lansing Lugnuts (May 9-11), Bowling Green Hot Rods (July 17-19) and the Dayton Dragons (July 20-22). Fans will be treated to a total of 25 post-game fireworks shows beginning Friday, May 10 with Thirsty Thursdays taking place all season long beginning on Opening Night. Kids, age 3-10, eat for free during Sunday games beginning on May 26 and every Saturday game from June 15 through August 31, fans will be allowed early entry into the ballpark with their game ticket for a pre-game concert in the Acres Music Garden. Additional special events, promotions and theme nights will be announced as they are confirmed throughout the off-season. The Cougars kick off this Labor Day weekend celebration with their final regular season homestand beginning on Saturday, September 1 against the Wisconsin Timber Rattlers at 6:30 PM. Highlights throughout the weekend include a pre-game concert from Hey Jimmy, Star Wars Night featuring costumed characters from the Midwest Garrison 501st Legion, in-game entertainment from BirdZerk and the final two fireworks shows of the season. To purchase tickets for any of the remaining home games during the 2018 season, call the box office at 630-232-8811 or visit kccougars.com. Follow the Cougars on Twitter, Facebook or Instagram for updates throughout the year. The Cougars, Class-A Minor League affiliate of the Arizona Diamondbacks, have been at the forefront of family-friendly entertainment since 1991. In 2015, the franchise became the first Class-A team in Minor League Baseball history to welcome 11 million fans through the gates. A total of 171 former Cougars have reached the Major Leagues including Miguel Cabrera, Nelson Cruz, Josh Beckett, Adrian Gonzalez and Kyle Schwarber.